Brown-May does not have any information on when stencilled advertising began in Melbourne. Stencilled advertisements were probably used prior to 1920 but before 1870s when it would have been pointless as the sidewalks of Melbourne were in too poor a condition. Advertising has long had a deleterious effect on Melbourne’s culture and on its street art in particular. Except that without the techniques and technologies of advertising, like stencils, there wouldn’t be street art. (See my post for more on the nexus of Art & Advertising). The footprint of advertising is still on us. Walking along Hosier Lane with the street artist, CDH who was half-heartedly tearing off the advertising posters. CDH was talking about making Hosier Lane an advertising free space (a worth while ambition). CDH wants to distinguish between art and advertising but I’m not sure that such a distinction can be made because the nexus between art and advertising means that there is no necessary feature to create a clear distinction. CDH and I have been discussing an article from The Atlantic Cities about Los Angels attempt to restrict mural adverting (“The Convoluted Path to Ending Los Angeles’s Mural Ban” by Nate Berg, March 22, 2012). 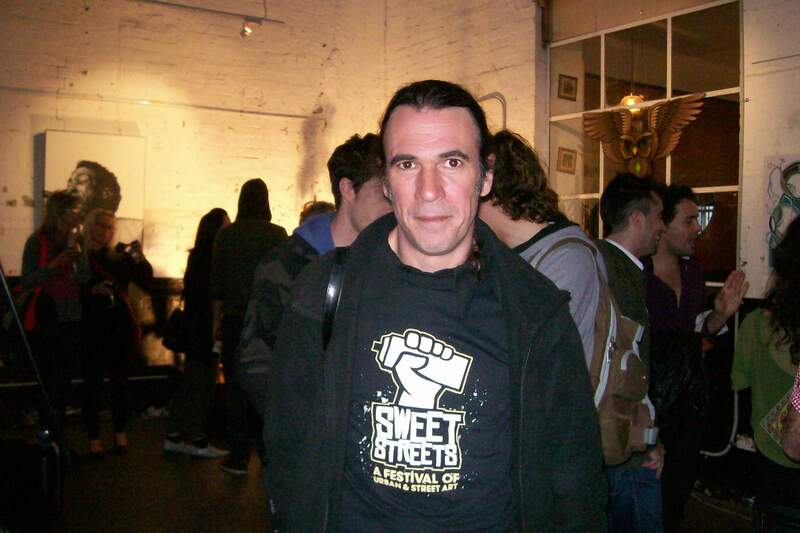 I have written about the relationship between street art and advertising in an earlier post. Aside from the propaganda element of advertising that has always been important in art and thinking only about avant-garde visual art and mass-market advertising it is clear that there is an increasing relationship in the 20th Century. The use of advertising material in the visual arts started with collages by the Dadaists and Kurt Schwitters. Was the word “Dada” taken from an advertisement for Dada brand shampoo rather than from the mythic random dictionary search? Almost anticipating Pop Art, Charles Sheeler’s “I Saw The Figure 5 in Gold” from 1928 used the bright colours and images of American cigarette packaging. American cigarette advertising was the start of modern advertising. In 1949 Raymond Hains and Jacques de la Mahé Villeglé used layers of torn advertising posters in a process they called “décollage”. In the 1960s many Pop artists used advertising material, Roy Lichtenstein used images from magazine advertising as the subject for his art although Andy Warhol concentrated on packaging design rather than advertising. In the 1980s many artists influenced by Pop Art used advertising material, most notably Jeff Koons and Barbara Kruger. Koons reproduced magazine advertising and made magazine advertising for himself that were printed in art magazines. Koons marketed himself as a brand. Kruger uses the same visual techniques as advertising in her art. Advertising has had a close relationship with the visual arts; not surprising since both the artists working in the advertising art department and artists not working in adverting have the same art education. In 1888 Pears Soap first used John Everett Millais painting “Bubbles” 1886 as advertising; Pears was another early innovator in mass market adverting. Also created in the 1880s Toulouse Lautrec’s posters advertising cabaret acts have now entered the art cannon (currently on exhibition at the National Gallery of Australia). Since then advertising has used notable artists to create images for advertising, like Absolut Vodka (see their art collection) or to endorse products, Dali and Lavin chocolate in 1968 (see the video). Given the increasingly close relationship between avant-garde arts and advertising it is likely that advanced art in the future will have more references to advertising. For more on this subject read Joan Gibbons Art and Advertising (I.B. Tauris, 2005). There is now a donate button on my sidebar. I am asking for donations to my Paypal account. Your donation will help pay the ongoing expense of running this blog. Looking at the costs of transportation, broadband, books and magazines the expense of writing this blog is beginning to add up. If you have enjoyed reading this blog, especially those people who have subscribed, consider donating. I have decided to try the donate approach to funding the production of original online content. I have tried finding sponsorship for this blog however it would be inappropriate for an art critic to be sponsored by a gallery. What would be appropriate is sponsorship from a business that makes money from art galleries and artists. There are few benefits for being an art critic unlike movie and theatre critics who get free tickets. Sure there have been a few free drinks at openings but the gallery would give them to anyone and I am not a big drinker so all these free drinks aren’t doing that much for me. One of the very few freebees that I have received in writing this blog was a copy of Illegal Fame Winter 08 because I wrote a short review of an old issue of their magazine in this blog. (Big shout out to the guys at Illegal Fame.) This year I have been treated me like the rest of the media, so I have been to a few media previews and received media packs (along with tea and nibbles). Another option for bloggers to make money is side projects; spin offs from the expertise that has been acquired from writing the blog. Maybe I still want that 2005 blogger’s dream – a book deal. Instead I have been doing a bit of work for people making documentaries about street art. To subscribe to this blog click the “sign me up!” button near the top of the right hand column on the home page. Subscribers receive notifications of posts by email. I would never sell or pass on my subscriber email lists to anyone else but I am examining what I can do with it. Would subscribers tolerate a monthly email from me with targeted advertising, e.g. for an arts festival or exhibition? I have been considering other offers for subscribers e.g. talks, gallery and street art tours. What do you want as a subscriber? Please leave a comment. Defenders of graffiti often point at the visual pollution of advertising, arguing that only economics separates the two and that graffiti if often more aesthetic than advertising. Increasingly advertising campaigns are using graffiti as part of their campaign. In 2007 there were stencils advertising for the Borat movie in Lt. LaTrobe St, in Richmond and in Centre Place. The publicists for the Borat movie thought that they could grab some hip free space but were greatly mistaken. Their ad was quickly covered up with “No Ad” in marker pen and “John Howard killed the Glasshouse” in a purple and yellow stencil. This zone of “extreme tolerance” towards graffiti is not going to tolerate the invasion of advertising. The advertising dollar might rule in the rest of the world but its images will be resisted in temporarily autonomous zones. Well, that is the idealistic version but some advertising does sneak through. The first stencil graffiti that I saw in Melbourne was the 1984 publicity campaign for the movie, Dogs in Space. That publicity campaign was a copy of the graffiti publicity campaigns that bands had used earlier (there is the notable use of stencil images from Crass and Black Flags). There are lots of viral advertising campaigns employing street art techniques, including advertising stickers posing as street art. One of the most sophisticated of these was Adidas’s Zero Tag campaign (see my blog entry and the comments on Lex Injusta) From the comments it appeared that this advertising campaign did not impress many street artists. Fly-posting of posters is just as illegal as paste-ups/wheat-pasting but because they are advertising they are tolerated more than art – there aren’t organizations against fly-posting but there are anti-graffiti organizations. The poster gangs of Melbourne quickly paste over any material that encroaches on their territory. The current use of chalk stencil advertising on footpaths is just as illegal as fly posting and graffiti. It has been used increasingly in 2009 to advertise universities, soft drinks, the Dali exhibitions, plays and awareness of sexually transmitted diseases. 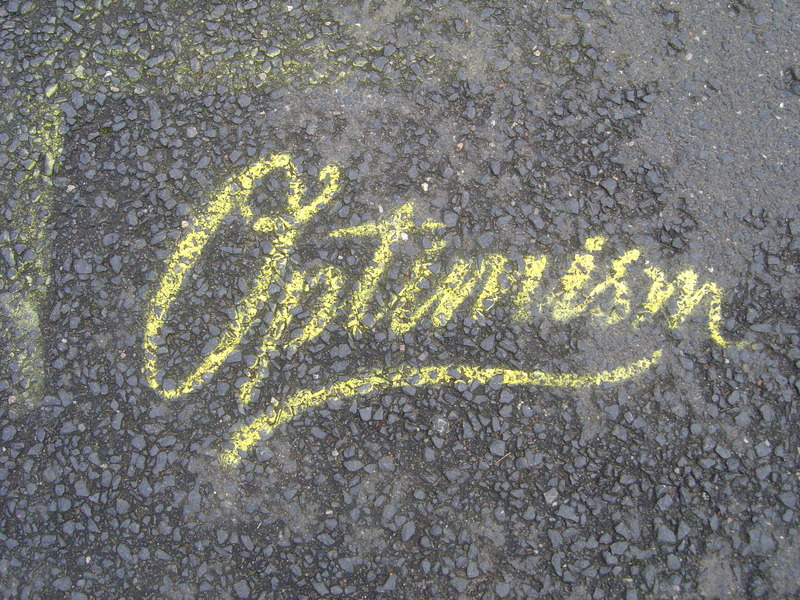 Advertising for the play "Optimism"